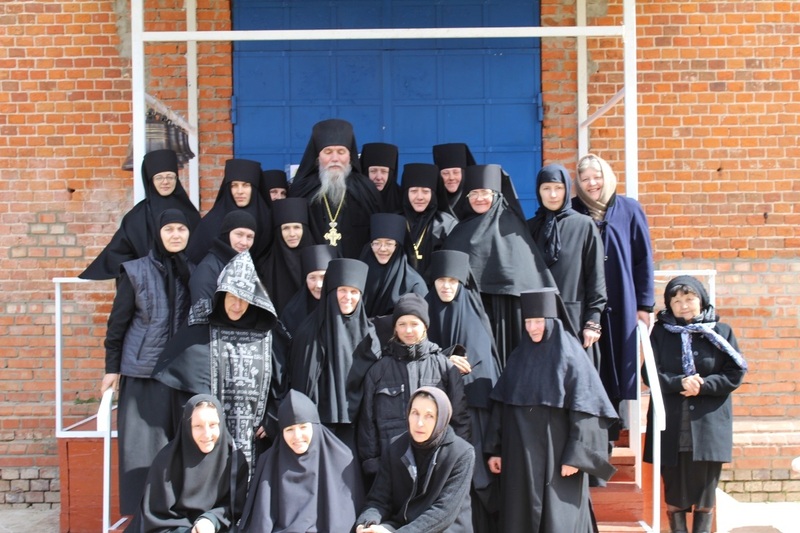 The convent’s sisters with their father confessor Archimandrite Anthony (Gavrilov). 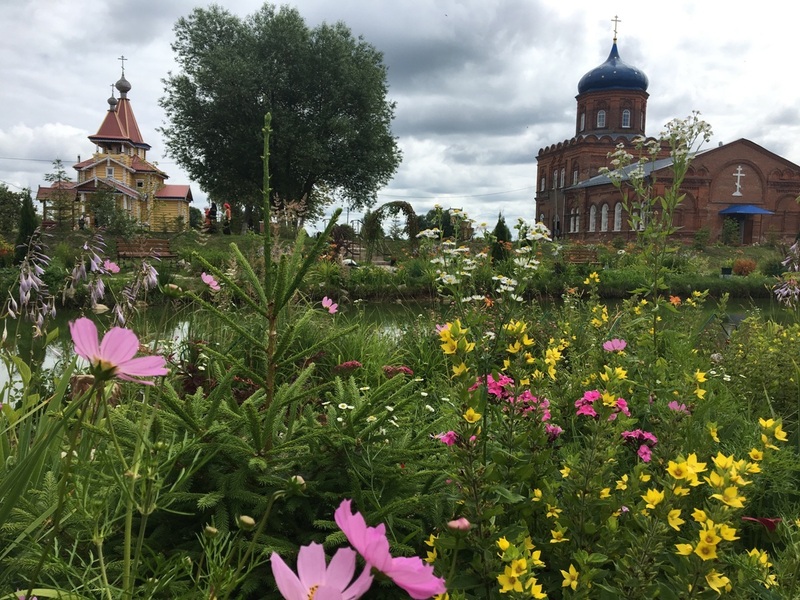 Having visited the Convent of St. Thecla and the Dormition, situated in the village of Senino not far from Optina Monastery in Russia’s Kaluga region, I was fascinated by the abundant mercy and grace that the Lord has been pouring on this place through the prayers of the nuns and their father confessor. 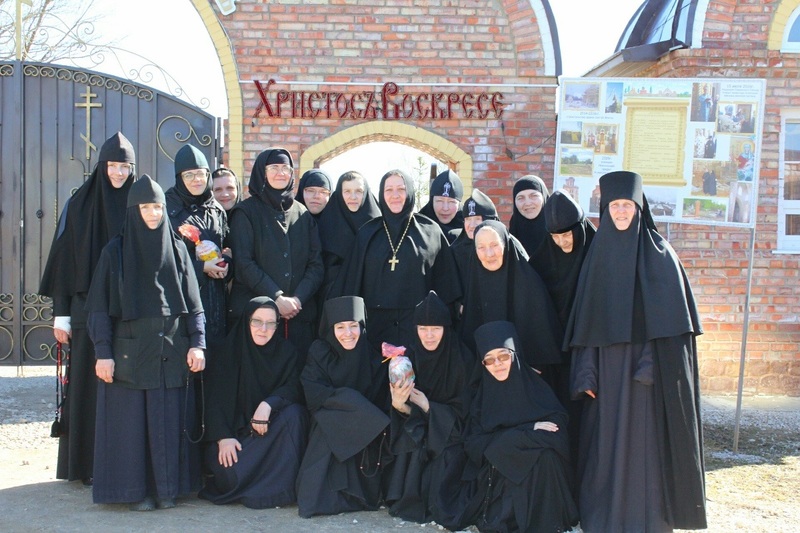 Its mother superior, Abbess Vitalia (Kochetova), has shared wonderful stories with me that can be compared with those from the Lives of Monastic Fathers of olden times. Mother Vitalia speaks. 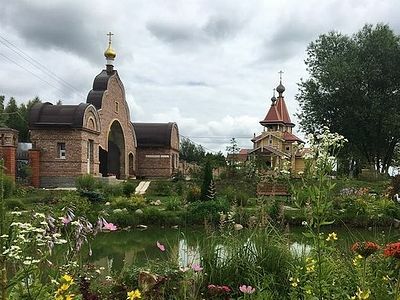 Many years ago one woman brought her little daughter Alla, who had cerebral palsy, to Optina Monastery and carried her into the church in her arms as the child couldn’t walk. After venerating the relics of the holy elders of Optina, the girl began to timidly walk on her own, though her feet remained rather weak. 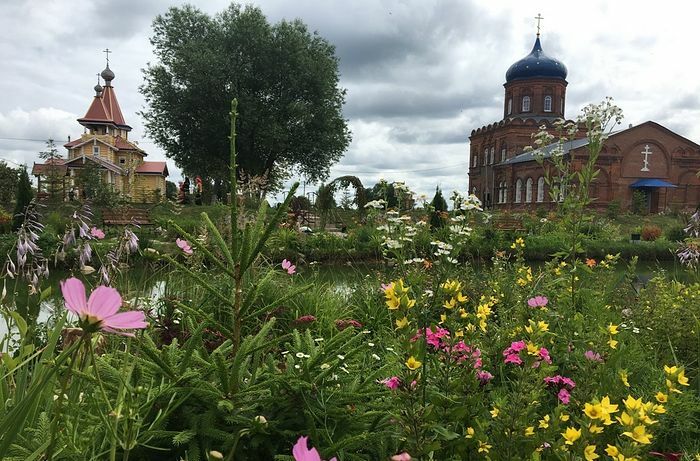 When she grew up, she came to Optina Monastery again to thank the venerable fathers for her healing. And the Optina Elders, through the living elder, our father confessor Archimandrite Anthony, blessed her to join our community in Senino. Now Alla lives at our convent and performs her obedience as much as her physical strength allows her. Within her first year at our convent her health considerably improved. The following miraculous story is associated with Alla. Once a group of pilgrims from Moscow came to us. We were waiting for them and planning to make a guided tour around the convent for them, to tell them about this place and its heavenly patrons. But since the shrines of the Kaluga region are numerous, our guests arrived to us very exhausted late in the evening by the end of our Vigil service. They asked us to arrange a short tour around the convent for them so that they could have a rest after that. 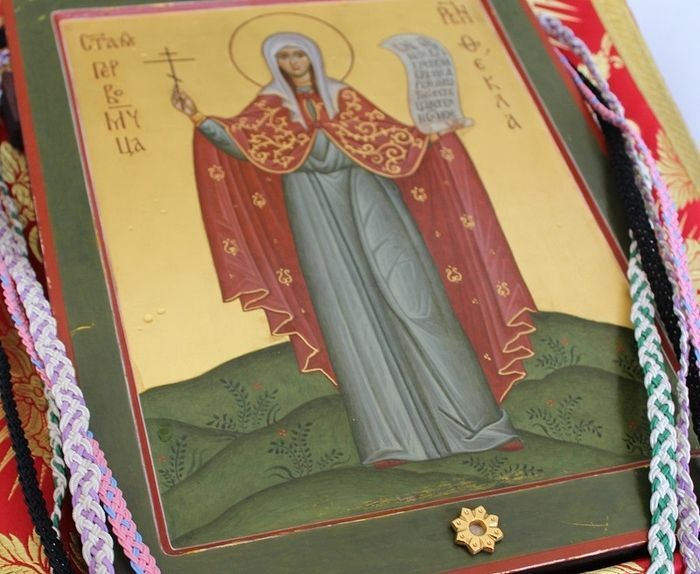 Icon of the Virgin Proto-Martyr Thecla. Next we came up to the entrance door which turned out to be locked. We decided to call the driver, who had stayed in the car, to ask him to come and open the doors. But all the mobile phones suddenly stopped working at that very moment. At last our pilgrims realized that something was wrong here. So when I suggested reading the troparion once more, and everybody agreed. We sang the troparion and the phones started working again. We called the driver, Pavel. He was a very tall, strong yet non-religious man; he would drive pilgrims to holy places without entering any churches. Pavel came up to the door and pulled it from the outside, but it wouldn’t open. It should be mentioned that this door is never locked with a key: it is always either latched or padlocked. The driver looked around and saw a church shop near the church where the light was still on. And it was our Alla, the one I mentioned earlier, who had stayed in the shop till late hoping that some of the pilgrims would be willing to drop in after the tour and purchase some mementoes of their visit. Thus Pavel went inside the shop and asked Alla to help him unlock the door. “Yes, no problem!” she replied. Alla came up to the church and easily opened the solid oak door with her feeble hand barely moves (a result of her cerebral palsy). 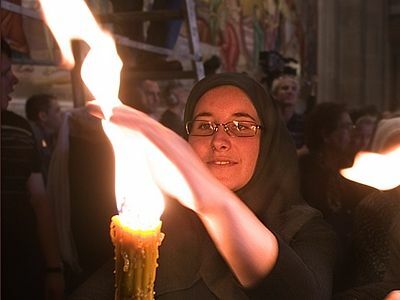 The driver (a healthy fellow) was dumbfounded… In the meantime, they heard the voices of the pilgrims singing the final part of the akathist hymn to the Virgin-Martyr Thecla. At length they sang “Amen!”, and all the pilgrims moved one after another towards the door. At this the pilgrims examined the door for a long time, trying to find out what had happened and why it did not open. Noteably, the feast of the icon of the Holy Theotokos of the “Sign” was celebrated on that day. Of course, we were pleased even with the little sum he had contributed, so we prayed for him as for our benefactor. Soon we learned that the businessman was under investigation and accused of some serious crimes, and that an amount of money that was many times as large as what we had requested for coal was seized from him. While in custody he remembered that he still had construction materials which hadn’t been confiscated, so he gave those materials to us. We thanked the man for his present and prayed for him as hard as we could. Shortly after that he was fully exonerated and released. He called us, wept and said that the charges had been extremely serious and that his acquittal had been a real miracle of God. After that incident the businessman went to confession and took Communion for the first time in his life. 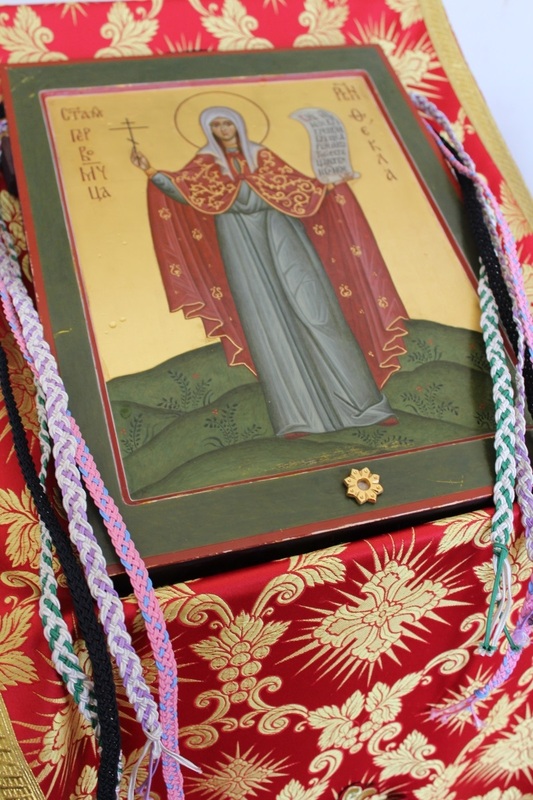 The history of our Holy Dormition Church is closely connected with the venerable Elder Nektary of Optina (1853-1928; feast: April 29/May 12) and his spiritual son, Priest Nicholas Bruni, who was the last priest of our church before its closure. In the early twentieth century there lived Nun Anna (Bruni) in a community for women near Optina Monastery. Bruni is a famous Italian surname—her ancestors came from Italy. Nun Anna had two adult sons, namely Nicholas and Leo; both were very talented and highly educated. All three of them were under the spiritual guidance of the Elder Nektary of Optina. Nicholas was an artist, a musician, a poet, an aircraft designer, and a test pilot all at the same time. He was awarded the St. George’s Order three times. In 1917, his plane was shot down in an air fight, caught fire and was falling. Nicholas vowed that if he survived, he would serve God as a priest. His companion died in the crash, but Nicholas survived and after regaining his health was ordained. Fr. 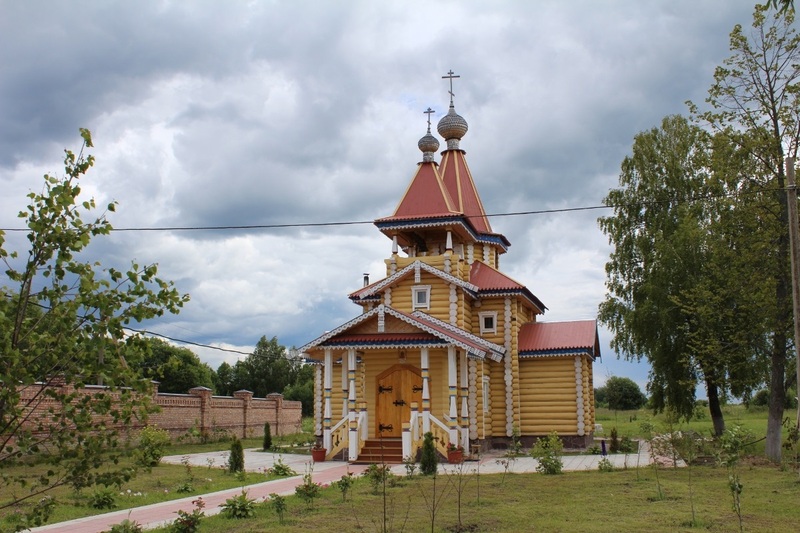 Nicholas first served in the Ukraine, then in Moscow, and finally moved to Kozelsk, closer to Optina Monastery, where he was assigned to the parish of Holy Dormition in our village of Senino, then called Kosyn. In those years it was dangerous to wear a cross around your neck, to say nothing of serving as a priest. So Fr. Nicholas asked Elder Nektary about his future—namely whether he should continue in the priesthood till the end of his life. In 1922, Fr. Nicholas moved to Kosyn and served in our church. In 1928, Elder Nektary reposed, and his spiritual son left Kosyn approximately at the same time. For some time he served in several other parishes, but due to the spread of the Renovationist movement he had to abandon priestly ministry. He worked as a stove-builder, a wood-carver, and senior engineer at the Moscow Aviation Institute’s airplane laboratory to provide for his family. In 1934, he was arrested and in 1938 executed by firing squad in Ukhtarka Camp. A witness who had seen the execution and miraculously survived recalled that on the way to the place of execution Fr. Nicholas sang psalms, and as a pastor tried to soothe his companions who had also been sentenced to capital punishment. Before their deaths, all followed the example of Fr. Nicholas by kneeling down and praying to God. Thus, all of them commended their souls to God with a prayer on their lips. Such a courageous pastor served at our church with the blessing of Elder Nektary. Interestingly, the Patriarchal Commission came to Senino to approve the status of our convent precisely on the feast-day of St. Nektary of Optina. The convent’s sisters with Abbess Vitalia. 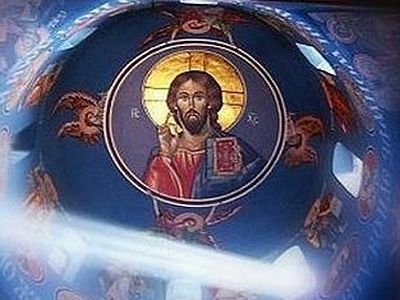 Through the prayers of our holy fathers, O Lord Jesus Christ, our God, have mercy on us! Some scientists (insufficiently educated in philosophy) categorically reject the possibility of miracles and regard a miracle as contradictory to the laws of nature. Very often such scholars assert that miracles appear to be either a fiction, a fraud, or such a phenomenon which science cannot at present explain, but will certainly be explained scientifically later on. What is unintelligible today might be intelligible and explainable tomorrow.